Fished off the Sonoma Coast, almost to Point Reyes. Limited on Rockfish and Dungeness Crab. 10 crab all pretty big at 2.5-3.0 pounds so about $230 worth of amazing crab. They look small in the sink because the sink is huge. LOL. No legal Ling Cod caught. So I am going to make homemade Tartar Sauce, dip the Rockfish in Panko, deep fry some fillets and have awesome fish sammiches. Salted water is going on the stove, sourdough bread with melted butter, crab and Champagne for dinner. Fun day on the ocean. We gotta have a bunch of fisher dudes with cool pics. Post'em up. Around here, blue crabs need to be 5" across the carapace to be legal. I've seen dead bodies pulled from the waterways down here...covered in blue crabs. Now, speckled trout (specks) marinated in Italian dressing...awesome!!! I have never had a Blue Crab but have heard nothing but good things. Supposed to be a bit sweet, right? Fills the 24" x 18" platter. Where do Speckled Trout come from? Crab, Lobster shrimp, all scavengers, and they taste great with good butter and Sourdough bread. I've had them done with "Crab Boil" as the seasoning and I have had them simply boiled with nothing. They are as good without seasoning as they are with it. They do have a sweet taste. They are my top seafood preference followed by shrimp. They are certainly worth trying if you ever get the chance. Yes, a little sweet and PITA to pick... we had to work for the meat. How did you prepare/steam 'em? Spotted seatrout, yellow mouths, paper mouths. Lots of different names for 'em. We always called 'em specks. Catch 'em in the bays and along the shallow coastal waters down here. Good eating! 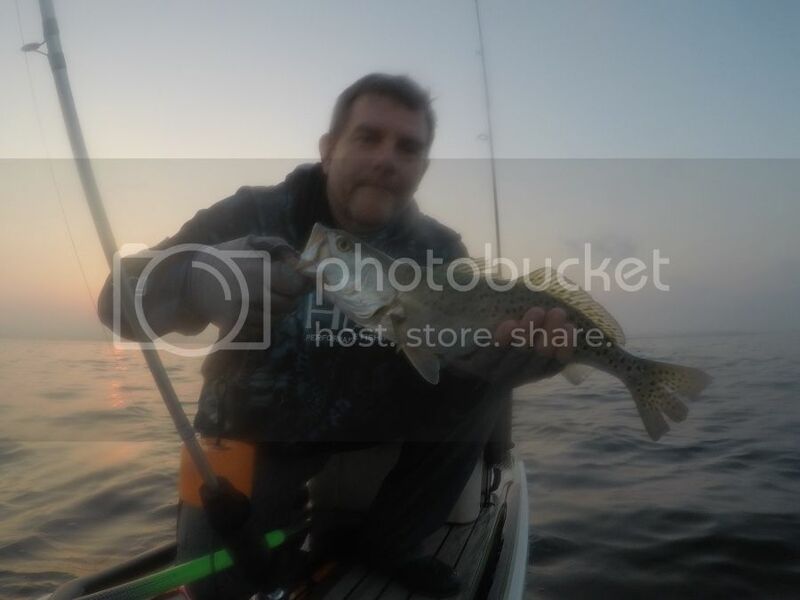 Expat, you got pictures of the rockfish? Curious which ones you caught. Was this all on the coastline rocks or a bay(like Bodega)? Nice haul there. Congratulations on your success. IIRC, Speckled Trout have nice teeth up front and they're a brackish fish. We fished the New Orleans areas and caught some of those before. Big pot, propane tank, single burner w/propane attachment hose, white vinegar, water, and a ton of J.O. Spice. Cook outside. Blue crab, dungeness, bearded clam, trout, base...mmmm. Nice, was out after trout last weekend. I flipped the paddle board earlier in the day, giving all the pics this great blur effect. No pics from this trip, but all were caught about a mile off the coast in rock formations in 100 feet of water. Used a big 10oz Chrome Hex Bar with a whole squid. For some reason the Ling Cod, a member of the Greenling family, were just not there. Usually, this early in the year we see the small 8-15 pound males. In the Fall the big females move in. The fish were the usual Blacks, Coppers, a very nice Vermilion, Blues, a China Cod. The Vermillion was about 8 pounds and a nice, solid, blood red color. Is the Speckled Trout like a Rainbow or Cutthroat? In CA we have Rainbows that head to the Pacific Ocean and get a new name of Steelhead. I know nothing of fish outside of CA. Last edited by Expatmedic; 4 May 2017 at 09:07. I will destroy some blue crab. I had to lay back and settle, then finished the rest. Last edited by KidA; 4 May 2017 at 10:43. About another month, some warm weather and Halibut will be hitting in the San Francisco Bay. Lot's of bait in the water now, Anchovies, Halibut love them. Love fishing for Pike and Walleye. Any time I can get to the lake I'm one step closer to Heaven. According to a marine biologist I was talking to, speckled trout, alone among all the trout varieties out there, have a propensity for eating their own poop.